A new study by an international tourism consultancy of 121 U.S. cities and destinations identifies which travel destinations offer the most very good or excellent experiences per visitor based on an analysis of consumer generated ratings and reviews in social media channels. “Destinations focus primarily on the quantity of visitors they receive each year, but maintaining a balance between quantity and quality is key to the long term sustainability and competitiveness of a tourism destination." 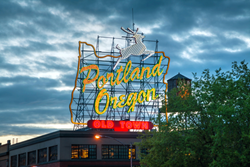 Portland, the city of roses, microbreweries, food trucks and friendly residents is a destination that knows how to charm its visitors. "It is an honor to see Portland ranked as the best quality tourism destination in the nation," said Jeff Miller, president & CEO, Travel Portland. "We believe strongly in the experience that our Portland hospitality industry partners provide visitors throughout their stay. From the airport and hotels, to restaurants, bars, shops and attractions, everyone's dedication to creating a quality visitor experience has played a role in this ranking." To download a free summary of the U.S Tourism Quality Performance Report, please visit http://www.resonancereport.com. Resonance Consultancy creates tourism development strategies, plans, and brands that shape the future of places around the world. The company provides leading public and private sector organizations with research, visioning, strategic planning, development strategy and brand strategy to help realize the full potential of developments, destinations and communities. To learn more about Resonance Consultancy, visit http://www.resonanceco.com.